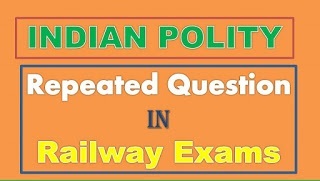 Indian Polity Repeated Questions Indian Parliament for Railway Exams: HI Viewers welcome to the our web portal ssc-ibps.com, in this post we are sharing the previous year Indian Polity asked bits in the Railway Recruitment Board Examinations like as Assistant Loco Pilot (ALP), Group D, NTPC (Non-Technical Popular Category) Online Computer Based Examinations. in competitive exams each and every mark is very important to getting the central government posts. This time RRB Recruitment Board has announced more than 1 lakh post in different categories like as ALP, Track Man, Police Protection Force (RPF) constable exams. Below we are given the all previous year asked question in Railway ALP and Group D Exams. Q. In which year Rajya Sabha was established? Q. Who elects the Vice President-?